How Long Does it Take Grass to Grow? We all know the old saying that “a watched pot never boils”, but when it comes to your lawn it could be said that “watched grass never grows”. Whenever you put down new grass seed it can seem like forever before the grass finally starts to take off. Obviously whenever you put down seed you are excited about how it will turn out, and you want results RIGHT NOW! The problem is, that is not how it works. You should set realistic expectations for your results so you aren’t disappointed prematurely. And unfortunately when it comes to grass growth there are several different factors that come into play to influence growth rate. Here are some timelines to help you understand what’s happening. Bentgrass – This grass type usually takes between 10 and 14 days to germinate. Bermuda grass – This type of grass takes between 10 and 30 days. Buffalo grass – This grass can take between 14 and 30 days. Centipede grass – This grass takes between 14 and 21 days. Fescue – This type will germinate between day 7 and 14. Kentucky bluegrass – Look for sprouts between 14 and 30 days. Rough bluegrass – This type will see growth between 7 and 10 days. Ryegrass – Look for growth between 5 and 10 days. It’s important to note that not all the seeds will sprout at the exact same time. But, if you’ve been waiting a sufficient amount of time and the area you seeded isn’t showing signs of life, then you may have to take a look at the factors that may have caused germination to fail before you try again. The most important factors in grass germination are soil temperature and water. Proper soil temperature can be tricky because, in order to know what soil temperature your grass will need, you first have to know if you have a warm season grass or a cool season variety. 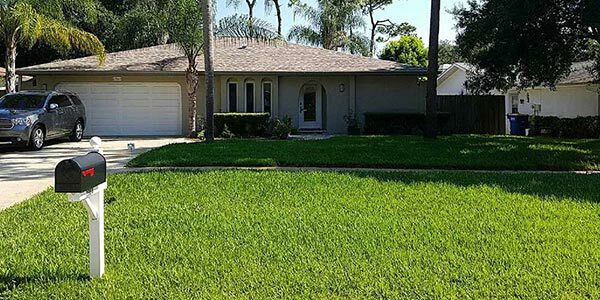 Obviously here in the Tampa area almost every lawn is seeded with warm season grasses. Having said that, we do have some “Snow Birds” here in the area that can use info about their cool season grasses in Midwest, Northern, and Pacific Northwest states. When it comes to watering your newly seeded lawn, you need to find just the right amount of water to apply. That’s because too little water will cause the seeds to dry out, but too much water will rot them. Both scenarios will inhibit germination. To make sure you’re watering just enough, you need to ensure there’s enough water to keep just the top two inches of soil wet. Water the area a day or two before spreading seed. If you ever notice water pooling or a ground that is spongy feeling, then you’re probably watering too much. Don’t forget to check for local restriction on watering, and find out your watering day. Growing grass isn’t that difficult, you simply need to know what kind of grass you should grow and when to look for signs of life. Follow these tips and you’ll have a lawn full of green grass in no time! 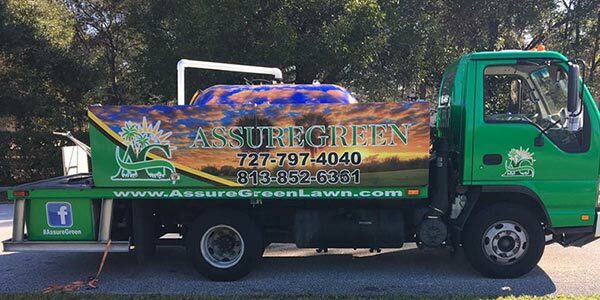 If you need professional help in making your lawn beautiful simply call Assure Green at (727) 797-4040. We’ll be happy to help.